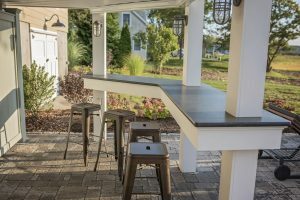 Which elements you decide to incorporate should ultimately come down to maintenance. Do you have the time to maintain the space on your own? Do you plan to hire someone to do it for you? Fortunately, if hands-off maintenance is a must for you, many landscape design companies do offer year-round maintenance as well. Any experienced landscape designer will first assess the land he or she has to work with before drawing up designs, as the land’s features will dictate which architectural types will work best with it. For instance, if the ground in your backyard slopes heavily away from your home, you may wish to build a wood deck. However, if it slopes towards your home, you may be best served by a walkout basement with a patio above it. If you want to enrich yours and your family’s lives in a sustainable manner, add an outdoor living space. Work with a professional to design the space that works for your family, home and lifestyle.